Already well known among vaporizer lovers with their other products such as the One 5.0 and the NO2, and the first Rise, Vapir delivers another high quality vaporizer with the Rise second edition. You won’t have any problems using the Rise as soon as you take it out of the box. 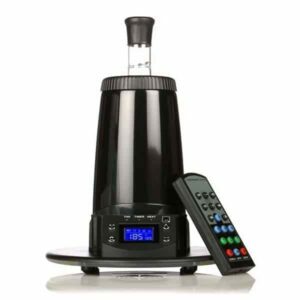 Setting itself apart from a lot of other models, the Rise can vape both dry herbs and concentrates without the need to attach anything. This feature alone is enough to convince a lot of users to purchase a Rise desktop vaporizer, but it doesn’t stop there. The Rise part two improves upon the original Rise model with increased power and even more vaping options. There is a setting you can pick that doesn’t use a fan at all, which allows you to take rips with a whip attachment that does not force any air. This is ideal for taking a nice rip or two without the desire to indulge in a full session, or especially useful for medical patients looking to medicate without getting too spaced out. If you’re the type that loves to blow huge, thick clouds can crank up the heat to 420 degrees. The heater is upgraded and is also easily cleaned. A pad that responds to touch operates the pinpoint controls on the Rise, which improves the efficiency and quality of your vape sessions. You can view your current temperature in either Fahrenheit or Celsius. The Rise heats up in less than 60 seconds, which not that many desktop vapes can claim. Want to vape with the typical silicone whip? No problem, the Rise does that. Ready to fill a balloon and pass it around the room at a party? The Rise does that, too. Filling up a bag with high quality vapor is of the utmost effectiveness and ease of use. No matter how you choose to vape, you’ll be impressed with the Vapir Rise. 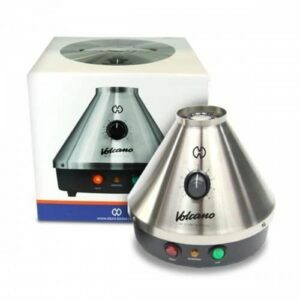 This desktop vaporizer is extremely well made, using the best parts the manufacturer can find. The steel components that the vapor travels down is clean, and you can rest assured you’d always get the tastiest rips. Despite operating with a fan that uses forced air, it is very quiet, and you’ll almost never hear it. You can pack the device up and take it to a friend’s house with no trouble. The heater is made from high quality ceramic. The unit even comes with an air filter that is approved by HEPA, meaning your vape rips will always be as fresh and tasty as possible, as long as you keep it clean enough. The perfect companion for my Volcano. I purchased this unit for it’s direct draw whip function and it has exceeded my expectations, so much so I haven’t blown up a balloon since I got it!